620	to 13,100	Sq. Ft. Proposed const, existing build avail. to show, dimensions approx. & pics & VT fm previous build, LAG has ownership interest. This model, The Haleyville (Modified)–±3,300 Sq. Ft, is a 4-BD/3-BA w/ a huge sunroom, split plan model and brought home the GOLD for Richard Sneed Construction in the 2016 POH. This is an open concept home with tray ceilings up to 14' in living area and 9 or 10’ceilings elsewhere. Beautiful tile/stone fireplace with wood mantle and built-in’s on one side. Kitchen includes island & pantry w/ an open layout, separate dining area & breakfast/café rm; open onto spacious great room. The master includes HUGE walk-in closet w/ deluxe master bath featuring dbl lav’s, walk-in shower & separate soaking tub. 2-car side-entry garage covered front entry porch & screened rear-porch overlooks beautiful backyard. Welcome to UpperEast Tallahassee! You won't find anything like it in Tallahassee - With only 24 total homes available, this progressive development was designed by Architects Lewis & Whitlock & built by GBGH Construction. These contemporary homes are built with high quality materials and upgraded finishes throughout. There are 3 floorplans available: “The AllAround” offers over 2600 sq. ft. of luxury living including a large kitchen with center island, Quartz countertops, huge pantry and European style cabinetry. The kitchen opens into a sun filled family/dining room with sliding doors that open to the back porch. The Master suite is on the 1st floor, with a 2nd Master upstairs. Enjoy an entire mile of walking trails through the wooded park and pond area, while being in the center of shopping, restaurants and schools. The Homeowner's fees will include not only common area maintenance but much of the exterior upkeep and maintenance of the homes & yards themselves. These homes will not last long, stop by our onsite office to get more information and choose your preconstruction home site! Drastically reduced! Bring all offers! Beautiful 2804 sqft, 5 bed/2.5 bath home on a large .61 ac lot. Offers an open & split bedroom floor plan w/ hardwood floors throughout the main living areas; tile in the kitchen, baths & sun-room; and carpet in the bedrooms. Enjoy a formal living room & dining room near the grand entry; an open family room w/ cathedral ceilings & corner fireplace; an eat-in kitchen w/ bar & breakfast nook (new stainless steel range & microwave being installed prior to closing) and a large sun-room overlooking a gorgeous tiered deck & fenced back yard. Large master suite w/ luxury bath, a deep, jetted tub; sep shower; water closet; double sink vanity; & his/hers closets. Plenty of space for a home office. New roof before closing. SELLER SAYS BRING OFFER!! LOCATION, LOCATION, LOCATION. PERFECT FOR THE GROWING FAMILY. Traditional brick home on beautiful lot (.87 acre) located in convenient NE area and 10-15 minutes to hospitals, shopping and downtown. Down the street from Gilchrist Elementary school. Perfect home for entertaining. Beautifully remodeled kitchen with stainless steel appliances that oversees open family room. Breakfast nook with bay window. Living Room with large bay window and with wood burning fireplace. Spacious Master Bedroom with sitting area. Large deck over beautiful backyard. Oversized 2 car garage with new Garage doors. SELLING AS-IS, NEW ROOF WILL BE REPLACED. A must see! A Model, (4BR) currently under construction. Welcome to UpperEast Tallahassee! You won't find anything like it in Tallahassee - With only 24 total homes available, this progressive development was designed by Architects Lewis & Whitlock & built by GBGH Construction. These contemporary homes are built with high quality materials and upgraded finishes throughout. There are 3 floorplans available: “The OverUnder” offers almost 2600 sq. ft. of luxury living including a large kitchen with center island, Quartz countertops and European style cabinetry. The kitchen opens into a sun filled family/dining room with sliding doors that open to the large back porch overlooking the 7.5 acres of Conservation area. The entire 1st floor is dedicated to living and entertaining space, while the 2nd floor accommodates the 3 spacious bedrooms and the laundry room. Enjoy an entire mile of walking trails through the wooded park and pond area, while being in the center of shopping, restaurants and schools. The Homeowner's fees will include not only common area maintenance but much of the exterior upkeep and maintenance of the homes & yards themselves. These homes will not last long, stop by our onsite office to get more information and choose your preconstruction home site! Beautifully Updated Home. Located within some of Leon Counties Top School Zones, This home features gorgeous wood floors, updated kitchen and bathrooms, new carpet in both guest rooms, soaring ceilings, screened back porch and multi level deck for entertaining, transferable termite bond, all on one of the larger lots in the neighborhood that backs up to green space. All Measurements are Approx. 3,723	to 3,939	Sq. Ft.
5,432	to 5,603	Sq. Ft.
TALLAHASSEE HOMES ON SALE BY PRICE! 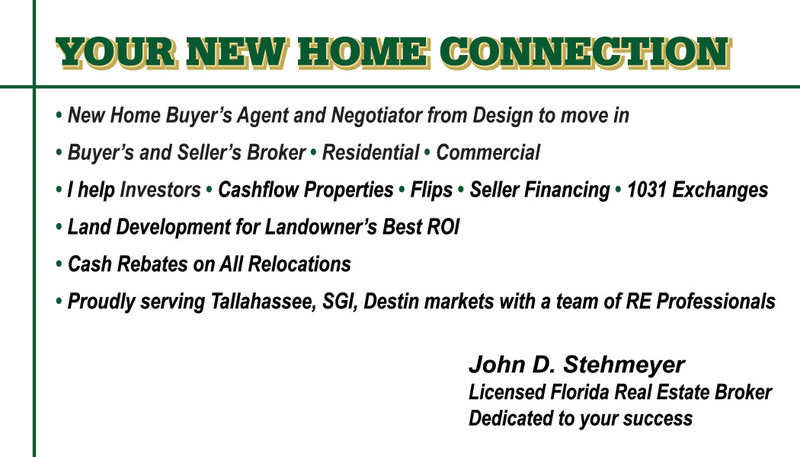 Call 850.545.4663 for John to help you. TALLAHASSEE HOMES ON SALE BY PRICE! 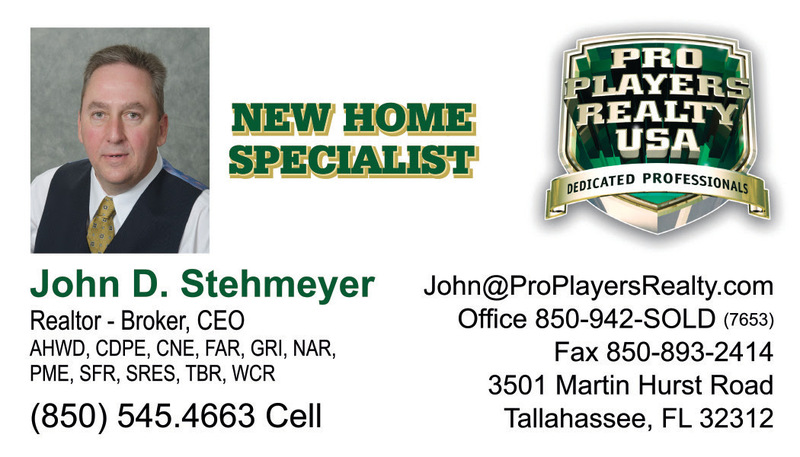 Call 850.545.4663 for John D Stehmeyer to help you. 1,164	to 4,084	Sq. Ft.
One of the last remaining homesites in unit 3 of Killearn Lakes. Priced to sell quick. Homesite next door is also available for $38,900. Buy both homesites and have over an acre in Killearn Lakes. Call your investors or builders ASAP on this great opportunity. Fantastic Home in Killearn Lakes Plantation! Immaculate 3 bedroom 2 bath Split floor plan with 2 Car Garage and an Awesome back deck overlooking a spacious fenced backyard. The property line also extends generously past the fence line on the right side of the home for even more room to play and spread out! This light and bright home features a cozy wood burning fireplace, attractive laminate wood flooring throughout the living spaces, Newer Roof, HVAC, and Appliances. Completely move in ready. Call to see this home today! Find yourself at home on this LAKEFRONT OASIS in Killearn Lakes. PLUS seller is providing a $10k concession towards closing costs or flooring! This lovely, single-story, 4-sides brick home includes a large, flat backyard on 149' of frontage on Petty Gulf Lake. Outdoor space includes massive covered patio and expansive deck, w/ easy access from kitchen and master suite; perfect for entertaining or hosting guests. From the front door you'll instantly be greeted by soaring 12' ceilings, large windows, open site lines through to the lake; absolutely breathtaking! Large kitchen w/ breakfast nook connects to massive family room. Spilt bedroom plan w/ oversized master and en suite, and den/office space close nearby. Laundry room just off oversized garage is one of the biggest you'll see. Available for 100% financing with USDA. Don't miss this updated home with a great open floor plan. It has a extra room that could be used in many ways, office, dining room, second living space or even a great play room for the kids. Kitchen and baths have been completely updated. Granite and stainless appliances in the kitchen. New floors throughout the house. No carpet! Split bedroom plan. Living room opens to a nice screened porch that looks over the back yard. 2 car garage. AC unit replaced in 2017. New roof coming! Great school zone! Close to restaurants and shopping at Bannerman Crossing. Don't miss this one! You have to see it to believe it! This Killearn Lakes home has modern updates with the charm and character of its classic construction. You'll never want to stop entertaining in this home as it boasts a hot tub, tiki bar, and pool room. The hardwood floors create a clean and cozy atmosphere. The master bath was completely remodeled from top to bottom using reclaimed heart of pine and reclaimed corrugated metal sheathing from old Jefferson County cabins. Don't miss this truly one-of-a-kind home! Amazing Home on Large Lot in Killearn Lakes!! This 3BR/2.5 Beauty Features a Big Living Room with Vaulted Ceiling, Two Sided Fireplace, Formal Dining Room, Kitchen with Breakfast Nook, Lots of Cabinet/Counter Space, Pantry and SS Appliances. Master Suite is Down and Includes Dual Sinks, Jacuzzi Tub, Walk In Shower and French Doors to Deck. Loft/Office/Bonus Area and Two Bedrooms Upstairs. Wonderful Yard and Deck for Entertaining. New Roof 2017!! Home Constructed Like A Fortress and Very Energy Efficient, 11" Thick Poured Concrete Walls with Styrofoam Cells, Well Insulated, Metal Girders and More!! Walk Through This Home Using The 3D Virtual Tour!! Tastefully updated brick home in Killearn Lakes! This move-in ready, split floor plan home features vaulted ceilings, quartz countertops in the kitchen, stainless steel appliances, marble subway tile on fireplace, walk-in closets in the master, dual vanity sinks in both bathrooms. This home sits on a quiet cul-de-sac, kid friendly street with fenced in backyard. Very Nice and private wooded lot, plenty of room to build your dream home. Gently slopes towards the street, leaving potential home site high and dry. Lot is located within walking distance of Lake Monkey Business Park. Lot also includes a nice, large outbuilding with power, water, septic tank and A/C unit - Sold AS-IS. This is a must see for one of the last remaining good lots in the NE. I want to help people buy homes in our area, even if they have just been turned down by a bank. Our programs help people make the transition from throwing away their money to home ownership. We offer our properties to deserving families with a reasonable down payment and the ability to pay a monthly payment comparable to and usually lower than rent. You are not renting the property or renting to own. You are buying it. One of the best things about buying a home this way is that you do not have to deal with banks and qualify based on institutional credit requirements. You can start building equity right away and stop paying rent. Seller financing can be a useful tool in a tight credit market. Buyers may benefit from less stringent qualifying and down payment requirements, more flexible rates, and better loan terms on a home that otherwise might be out of reach. Sellers typically don’t charge buyers points (each point is 1% of the loan amount), commissions, yield spread premiums, or other mortgage costs, they often can afford to give a buyer a better financing deal than the bank. They can also offer less stringent qualifying criteria and down payment allowances. You will be responsible for the taxes and insurance just like any other homeowner. We can however escrow taxes and insurance for you if you like to help you budget for these expenses. Sometimes it is a requirement for approval. Many of our homes range in price from $39,900 to $99,900 and typically require a down payment of $3,000 to $10,000. We have found that this is the best price range to find homes that are in decent neighborhoods where people want to own a home and raise a family. We can also help people with homes between $100,000 to $750,000 with an appropriate down payment. We offer single family homes, double wide mobile homes with land and townhouses. Most of our properties are move in ready or close to move in ready. For this reason, we do not typically make any improvements to the property prior to offering it to deserving people to save them money. Most properties are sold “as is where is”. So it is the responsibility of the purchaser to make any necessary repairs and to inspect the property thoroughly prior to purchase. We recommend getting a home inspection prior to purchase. Unlike other companies that buy distressed bank owned properties in bulk and then resell them by auction to investors; our properties are hand picked and purchased one at a time based on our strict guidelines. Because we hand pick all of our properties, as you can imagine, they go very fast. So if you see a home you are interested in you need to act fast before it is sold. Please contact us today to get the process started so you do not miss the home you want. Get on our waiting list so we can start looking for your home. The process is fast and very simple. Simply call our office at 850.942.7653 and one of our friendly homeowner specialists will be glad to assist you in helping you become a homeowner. Tell your friends we want to help them too.